The rumor mill and Wall Street analysts are pretty certain that Apple is going to release three smartphones this September, and all of them will have an iPhone X-like design. Two of them are said to feature an OLED panel while the third one would sport an LCD screen. And all three of them will have a notch at the top to accommodate the ear speaker, front camera, and Face ID sensors. Based on recent leaks and rumors, one designer has come up with an interesting iPhone X2 concept. His iPhone X2 concept renders even flaunt a triple camera system, which is unlikely to appear on the 2018 iPhones. A lot of people hate the iPhone X notch, but the phone’s massive success has given Apple further confidence to retain the cutout in its 2018 iPhones. Apple CEO Tim Cook has told investors that the iPhone X was the top-selling iPhone in every week since its launch in November last year. The new iPhone X2 concept video comes from noted designer Muhsin M. Belaal Auckburaully, who is behind the YouTube channel DBS Designing. The biggest highlight of the concept phone is not its design, but the triple camera system on the back. Interestingly, the third lens appears separately below the dual camera setup. It would have looked even better if all the three lenses were arranged in the same cutout. Apple is rumored to be working on a triple camera system, but it is unlikely to debut with the 2018 iPhones. The iPhone X2 and iPhone X Plus are said to have an upgraded version of the iPhone X’s dual camera setup. 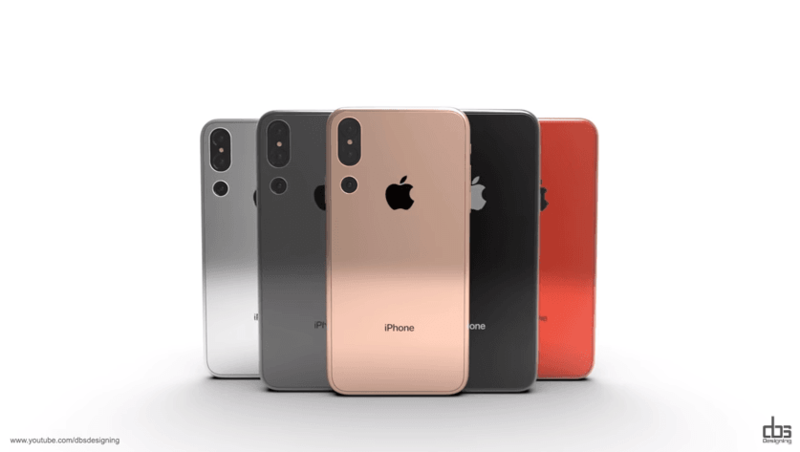 KGI Securities analyst Ming-Chi Kuo claims the LCD iPhone would feature a single camera on the back. Citing Yuanta Securities analyst Jeff Pu, Taipei Times reported that Apple’s 2019 iPhones would have a triple camera system that would enable 3x or 5x optical zoom. Recently, Chinese vendor Huawei launched the P20 Pro with a triple camera system consisting of a 40MP wide-angle lens, a 20MP monochrome lens, and an 8MP telephoto sensor with 3x optical zoom. According to DxOMark, Huawei’s P20 Pro has the world’s best smartphone camera. Auckburaully shows the iPhone X2 in five different color options. There are gold, black, silver, gray, and a stunning PRODUCT(RED) colors. The designer has imagined only the iPhone X2 concept. The video doesn’t include the 6.5-inch iPhone X Plus or the 6.1-inch LCD iPhone. Separately, ChargerLab claims that the next-gen iPhones will ship with an 18W USB Type-C Lightning fast charger. It will enable faster charging speeds and faster data transfer than before. Currently, Apple ships iPhones with a mini 5W power adapter. The new charger will also allow you to connect your iPhones to Macs. According to Ming-Chi Kuo, all the three iPhones coming out this September would feature the Face ID technology. Kuo claims the LCD variant will cost in the same range as the current iPhone 8. So, it will feature only a single camera on the back and launch without the 3D Touch functionality to keep its manufacturing costs down. A recent report from Mac Otakara claimed that the 6.5-inch iPhone X Plus will have the same dimensions as the iPhone 8 Plus. The iPhone X Plus will be able to pack a bigger display in the same form factor as the iPhone 8 Plus because it would have a bezel-less OLED display and no physical home button. However, Mac Otakara added that it would be 0.2mm thicker than the iPhone 8 Plus’s 7.5mm because of the vertically aligned rear camera. All the three upcoming iPhones will be powered by Apple’s custom A12 processor. TSMC has won the contract to manufacture the A12 chips using its 7nm process technology. TSMC claims its 7nm processors will be 20% faster and up to 40% more energy efficient than 10nm chips such as the A11 Bionic. The iPhone X2 and iPhone X Plus would pack 4GB RAM while the LCD iPhone would offer 3GB RAM, according to Ming-Chi Kuo. Kuo has learned from supply chain sources that Apple will launch single-SIM as well as dual-SIM variants of the LCD iPhone. Dual-SIM phones are particularly popular in Asian countries and among international travelers. However, Apple is unlikely to sell the dual-SIM model in the US because of resistance from telecom carriers. Kuo estimates that the single-SIM model will be priced between $550 and $650 while the dual-SIM LCD iPhone would set you back by $650 to $750. Meanwhile, the Economic Daily News reports that the iPhone X2 would cost slightly less than its predecessor iPhone X, which had a starting price of $999. The iPhone X2 would start at $899 while the 6.5-inch iPhone X Plus would have a starting price of $999.